Nancy Pelosi wants you to know she’s not going anywhere. Despite grumblings from some Democrats and dismal approval ratings, the House minority leader aims to keep an iron grip on her leadership role, saying in an interview Tuesday that she fully intends to lead House Democrats if they recapture control of the chamber in November, as many prognosticators believe is likely. “We will win. I will run for speaker. I feel confident about it. And my members do, too,” Pelosi told a meeting of Globe reporters and editors. She was in Boston for a Democratic fund-raiser hosted by Representative Katherine Clark. Pelosi, a 30-year veteran of the House from California, said her role as the most senior female Democrat in Washington is even more vital following Hillary Clinton’s 2016 loss, which left the top jobs in Washington in control of men. Pelosi’s determination to hang on could not delight Republicans more. The GOP, desperate to stave off a blue wave in November, are pounding Democrats in swing districts by linking them to the 78-year-old former speaker, who guided the Affordable Care Act and the Dodd-Frank Wall Street overhaul through Congress during Barack Obama’s first term. They’re featuring Pelosi in at least a third of their House campaign advertising, according to a USA Today analysis. And some in her own party are scrambling to disavow her. Anti-Pelosi feeling was so strong in the special election in a Republican-leaning Pennsylvania district earlier this year that Democratic candidate Conor Lamb paid for his own ad boasting that he “already said on the front page of the newspaper that I don’t support Nancy Pelosi.” He won the seat. Pelosi said the GOP strategy shows the “bankruptcy” of the opposition’s ideas and the negative ads only help her cause. She says Democrats are running on an economic message of raising the minimum wage, boosting education, and strengthening the health care system. But Democrats are mostly counting on a Trump backlash to provide big gains in midterm elections. Pelosi is a master fund-raiser, pulling in tens of millions of dollars that Democrats will use to help House candidates across the country, even those who are skeptical of her leadership. In a show of force, she raised more than $16 million for Democrats in the first quarter of this year. Even Pelosi’s fiercest critics admit she is a whiz at raking in money and at counting votes. She’s managed to keep her fractious caucus together in the Trump era, increasing her clout in spending negotiations and wresting key concessions from Republicans even while in the minority. But some in the party are questioning the message it sends to the grass roots that the top three House Democrats are all in their late 70s and have been in power for years, despite running on a message of change in the midterms. “I think there’s a strong desire out there in America for new leadership in Washington, not just getting rid of Republicans but getting new leadership in the Democratic Party,” said Massachusetts Representative Seth Moulton, one of the loudest voices in the party calling for Pelosi to go. Pelosi, who became the first female House speaker in history in 2007, says she thought about stepping down if Clinton had won the presidency, knowing that the Affordable Care Act would be safe and another woman would be in a key leadership role. That all changed with Donald Trump’s election — and now she says she’s here to stay. In 2016, nearly a third of Democrats voted against her in the first round of leadership elections, instead backing Representative Tim Ryan of Ohio. But Ryan has said he doesn’t plan to challenge Pelosi again, and it’s unclear who, if anyone, might step up. Even some Democrats who voted against her in 2016 don’t want to litigate her leadership now, before the crucial midterm elections, when Democrats need to present a unified front. “We’ve really got to focus on getting the House back, and then we can begin infighting after,” said Representative Stephen Lynch of Massachusetts, who backed Ryan over Pelosi in 2016. But in some competitive primaries, the infighting has already begun, causing more hand wringing over the party’s leadership and future. Pelosi’s No. 2, Representative Steny Hoyer of Maryland, drew fire after a Democratic candidate in Colorado secretly recorded a conversation in which Hoyer urged him to drop out of the race and lay off attacking the other Democratic candidate, a military veteran who is backed by the party establishment. 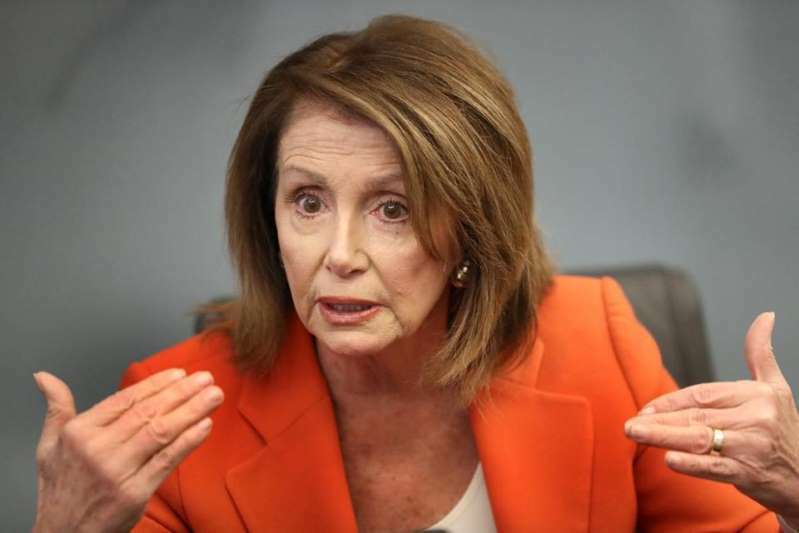 “I don’t think Steny did anything, he was just telling somebody what the reality of life was in the district,” Pelosi said in the Globe interview. She added she has not personally urged a Democrat to drop out of a race, but has no problem informing people she does not believe they can win the general election and thus won’t receive party money even if they win the primary. This is part of a larger Democratic strategy to ensure candidates who are deemed too liberal to win their districts don’t survive the primaries. “That’s how we have to make those cold-blooded decisions,” Pelosi said. These are the types of internecine battles that could trip up Democrats’ march to the majority. But Pelosi frequently touts her electoral success in 2006, when Democrats, under her leadership, took back the House, as a reason why she’s still the best person for the job. “I know how to win,” Pelosi said. Others are skeptical that’s the right playbook more than a decade later.